That record, and the David Hadju biography — as well as digging into great Strayhorn numbers like Blood Count and Day Dream (so hauntingly covered by Chet Baker near the end of his life) — made clear to me and others that the Duke’s arranger (gay, introverted, modest) was a serious figure of his own. 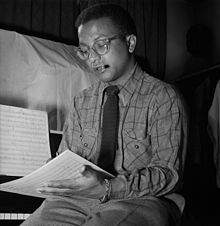 We’re now a few decades into the Strayhorn revival, and we’re now about to get a new theater/dance piece, based on the artist’s life and work, at REDCAT/ Disney Hall. I enjoyed meeting David Rousseve, the choreographer behind Halfway To Dawn ; he comes from Louisiana Creoles,was raised mostly in Houston, broke in as an artist in the ’80s East Village, and had a lot to say about the way culture, ethnicity, and artistic scenes work. In any case here is my Los Angeles Times piece on Strayhorn and Halfway To Dawn. My book came out in 2015, and won the National Arts & Entertainment Journalism Award. The New Yorker called it "a quietly radical rethinking of the very nature of art in modern life"
I urge you to buy it at your favorite independent bookstore or order it from Portland's Powell's.